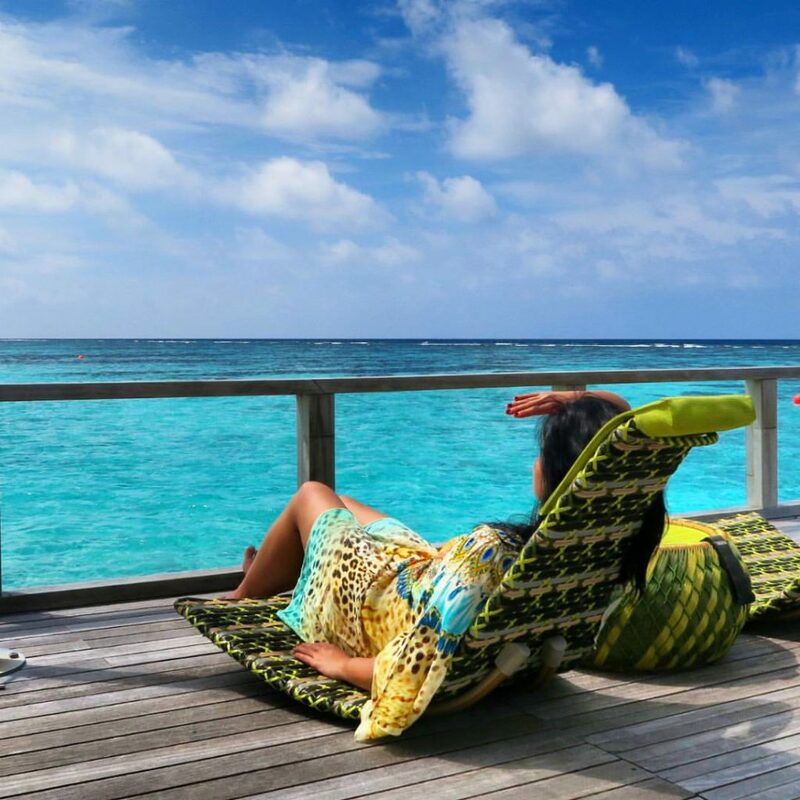 Located just 25 minutes by speedboat from Male, Velassaru Maldives is a resort that offers a “luxury undressed” kind of hospitality and vibe. It strikes that perfect balance between the “no shoes no news” policy and a luxury resort with the pamper package works. Well this can be a loaded question as depending on their interest, some may want to know when the best time is for surfing, diving, etc. But more often than not, people are torn whether to go during the best sunshiney weather (peak season) or take advantage of the shoulder season. Just for the record, the Maldives is rapidly growing and becoming more popular that there rarely is a ‘low season’ anymore. 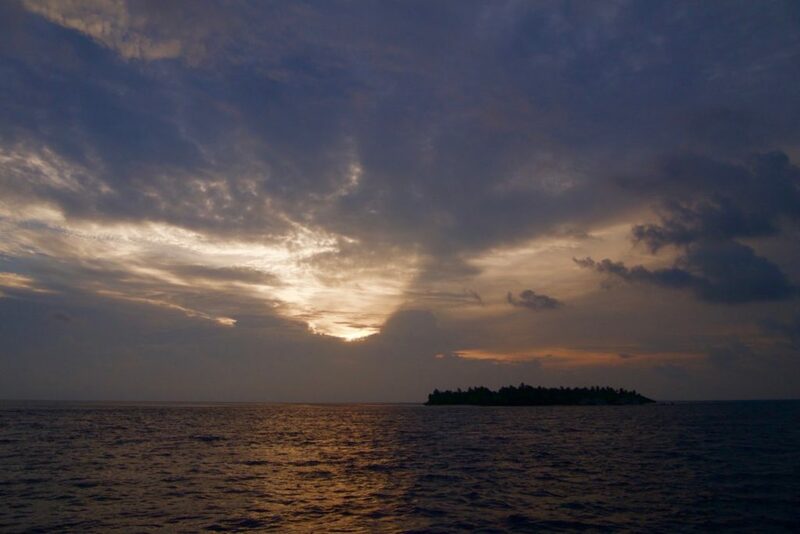 I went to the Maldives in November, and though that is already the tail-end of the rainy season, clouds were still grey and there were occassional showers. Most days that I was at Velassaru Maldives were rainy and grey. But this did not stop me from having an unforgettable time. 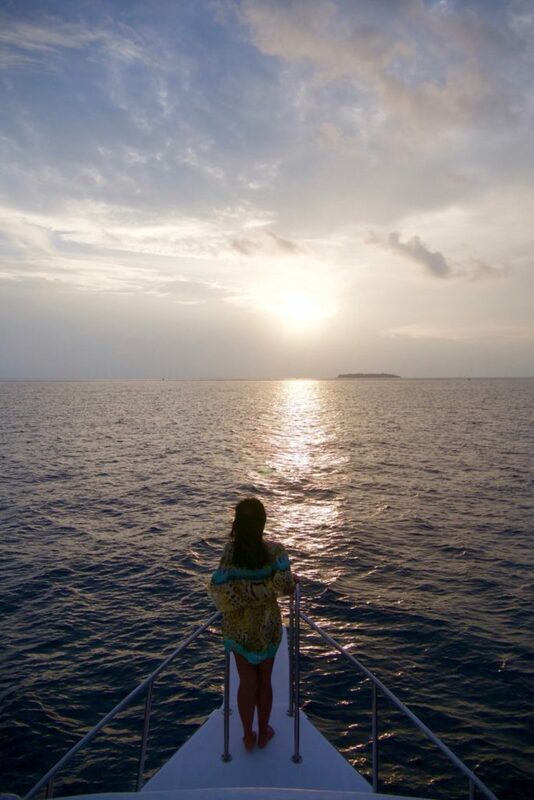 Velassaru Maldives: Always take the weather with you! Well let me take you back on my journey to Velassaru so you can see how the weather didn’t really get in the way of having fun in the Maldives. We flew from Dubai to the Maldives on this trip. And having arrived in Male at 9 AM, it meant that we left Dubai at 4AM. With very little sleep, I really appreciated that Velassaru Maldives was just 25 minutes by speedoat from Male Airport. Whatever grogginess I felt were literally blown away by the fresh air and breeze. Arriving at the resort, we were greeted very warmly by the team and staff of Velassaru waiting for us at the arrival dock, already waving as our speedboat came closer. 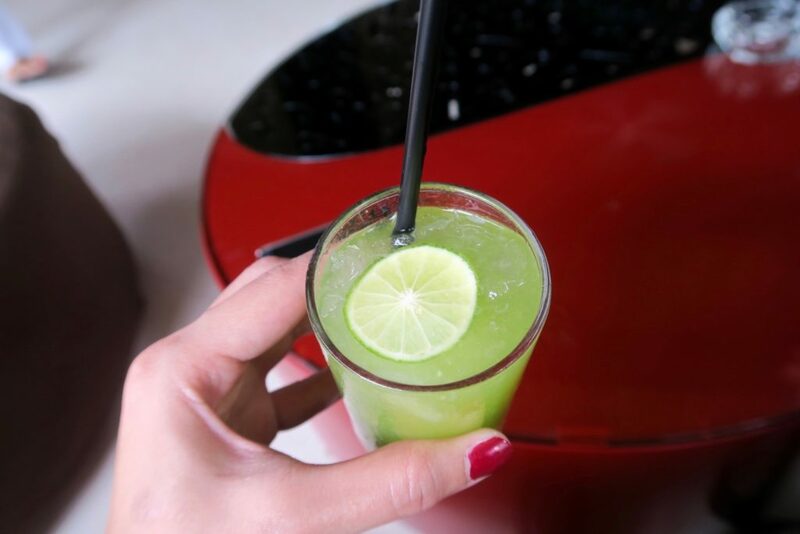 A very refreshing and citrusy lime welcome drink was given to us. And though we arrived a little early for check-in, our room was ready in about half an hour. 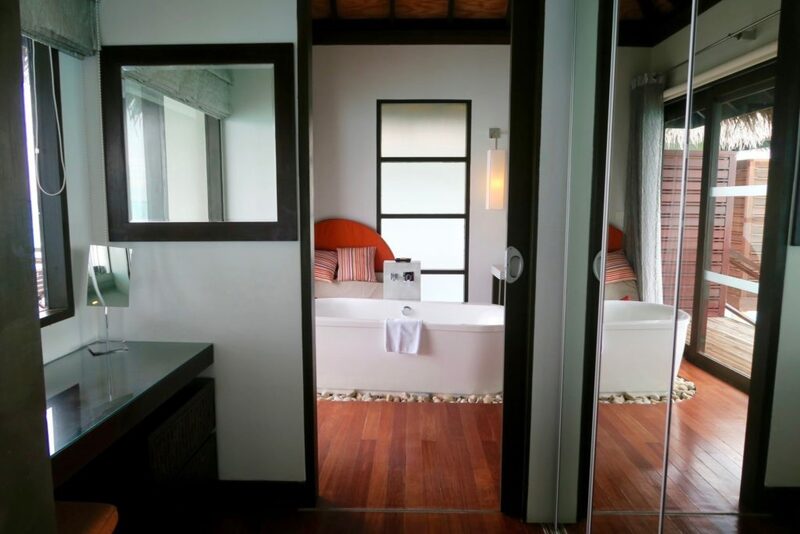 At 112 square metres, the Water Villa is one of three overwater categories at Velassaru ( the other two are the Water Suite and Water Villa with Pool). Actual check-in was done inside the villa as the staff also gave us a mini tour and got us acquainted with the room amenities. Villa amenities include an LCD TV, DVD Player, Complimentary In-house movies, a wine chiller, and a Nespresso coffee machine among others. One rainy afternoon, I just lazed inside the room after scuba diving, and was happy as a lark just watching “Identitiy Thief” starring Melissa McCarthy (it’s hilarious!). It was the best mindless 2 hours I’ve had in a long while. I particularly liked the floor to ceiling glass that surrounds the villa (save for one wall). It’s wonderful to wake up to the ocean view first thing in the morning. The dressing area and wardrobe also serves as a walkway to the bathroom. 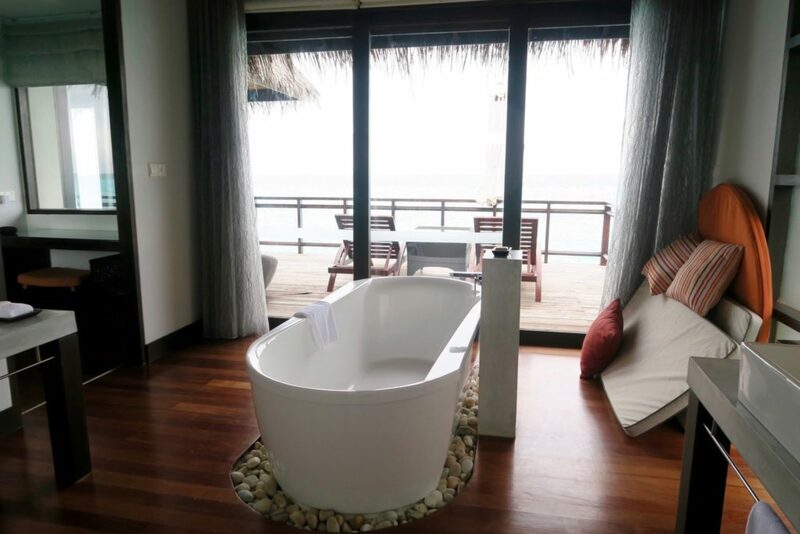 The stand alone tub faces the overwater balcony which makes for an even more relaxing experience. There are two sinks on opposite ends , with L’Occitane toiletry sets on each of the sinks. Velassaru is not an overly huge island so there’s no need for buggys. Part of their “luxury undressed” style is having the freedom to roam around the island, go in and out of your villa as you please, without having to call for a buggy. We were in villa number 411, and I loved that walks to and from villa / restaurants were long enough to serve as a mini workout. While villas are not equipped with bikes, the villa attendants use a bike with 3 wheels (as above) to carry room amenities around. 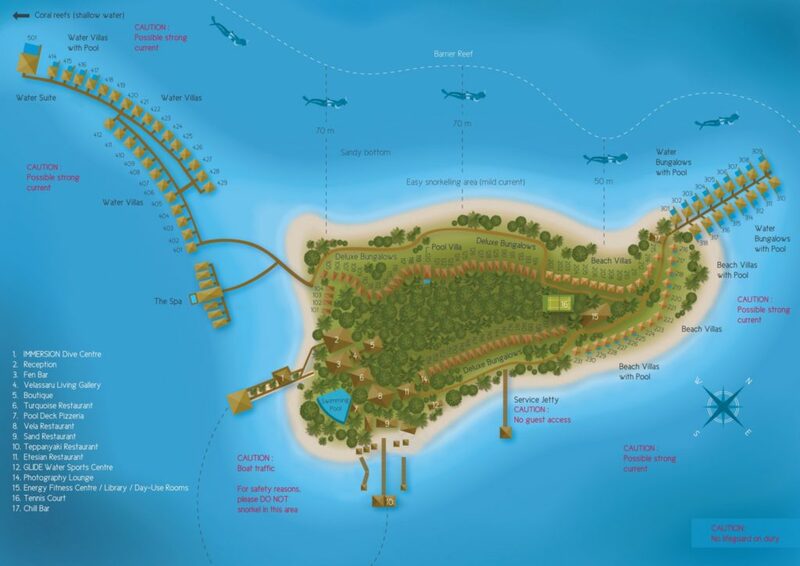 There are 6 restaurants and bars in Velassaru. 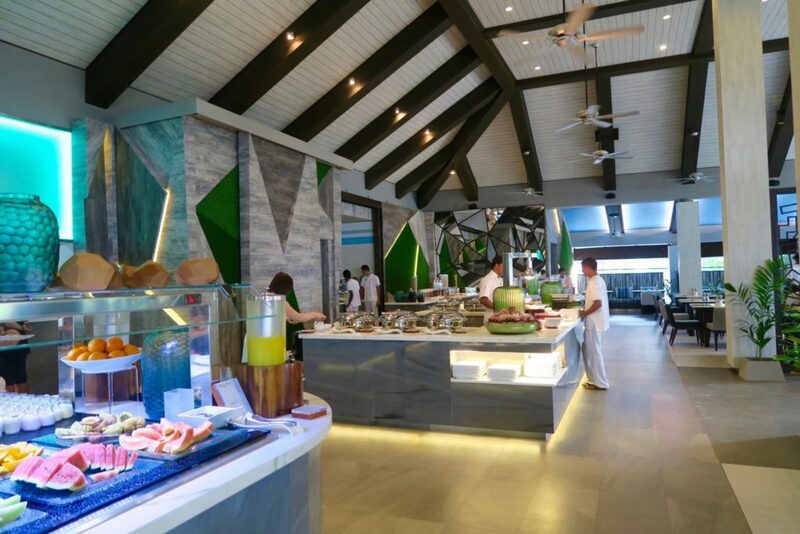 I personally think that the food and beverage in Velassaru is one of their strongest suits. For a relatively small resort, having 6 places to dine is quite a lot. I was able to sample 5 of the places and all of them had that great Maldivian-Pan- Asian fusion flavour that I love. We had lunch at Turquoise Restaurant which specialises in “Intergrated International Cuisine”. 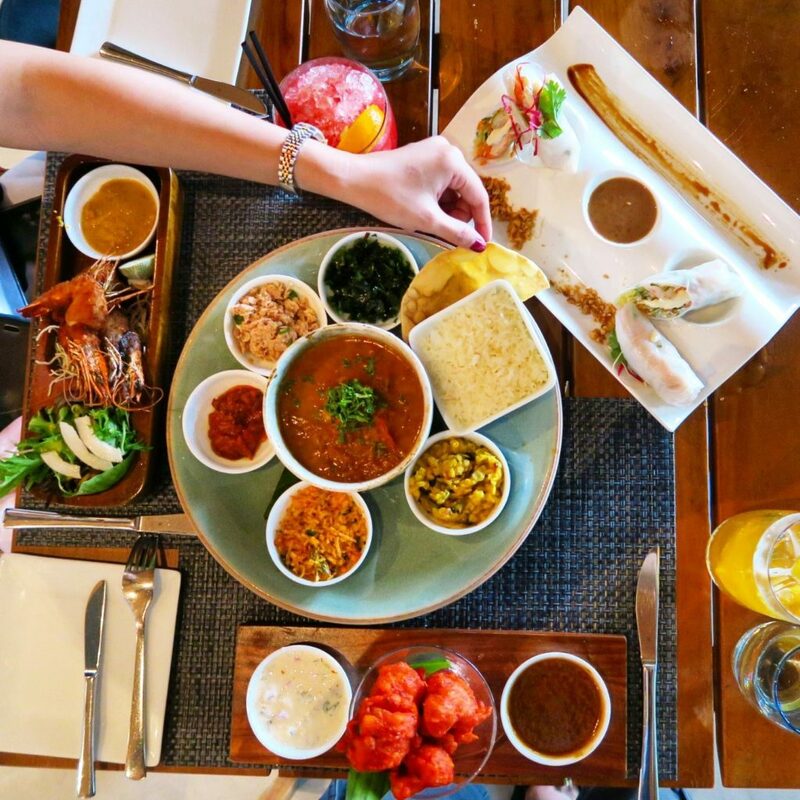 We had a seafood curry plate along with other dishes that had that Maldivian touch to classic Asian favourites like fresh prawn spring rolls, satays, etc. Another great place to have lunch or afternoon snack is Chill Bar. 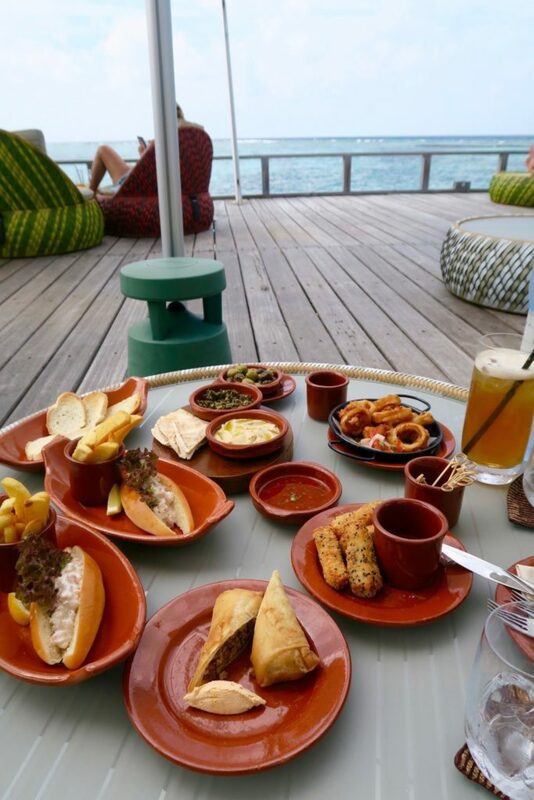 They have a generous selection of fingerfood that’s just perfect for that light lunch in between swimming and activities. And then there’s Sand, an oceanfront dining with private pavillon set-ups. I had prawn curry for my main. 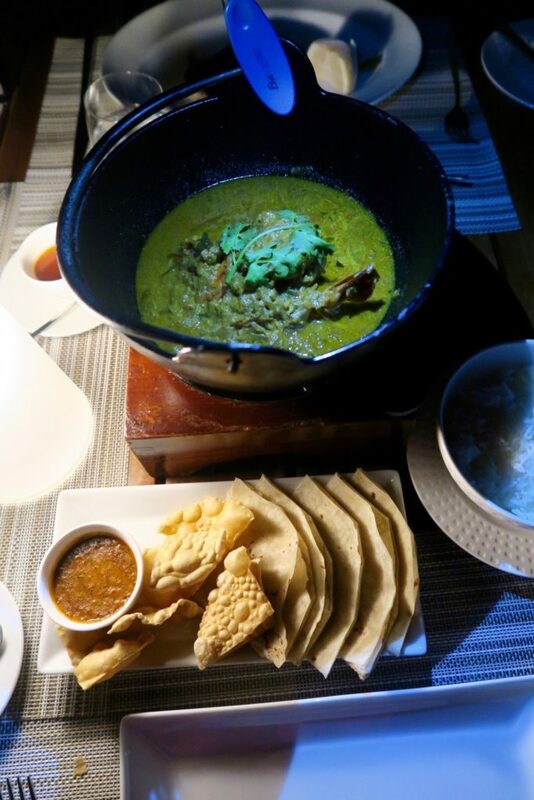 I just can’t get enough of Maldivian curries! It’s coconut infused and milder than your normal curry. And the prawns were so fresh too! There was also a live hot stone grill so the air had a great aroma mixture of seawater, air and coconut charcoal grill. There was also a live Boduberu dance in the middle of the night which made for great entertainment. Boduberu is the traditional Maldivian song and dance with a lot of percussion and drum beats, originating from East and South West Africa. 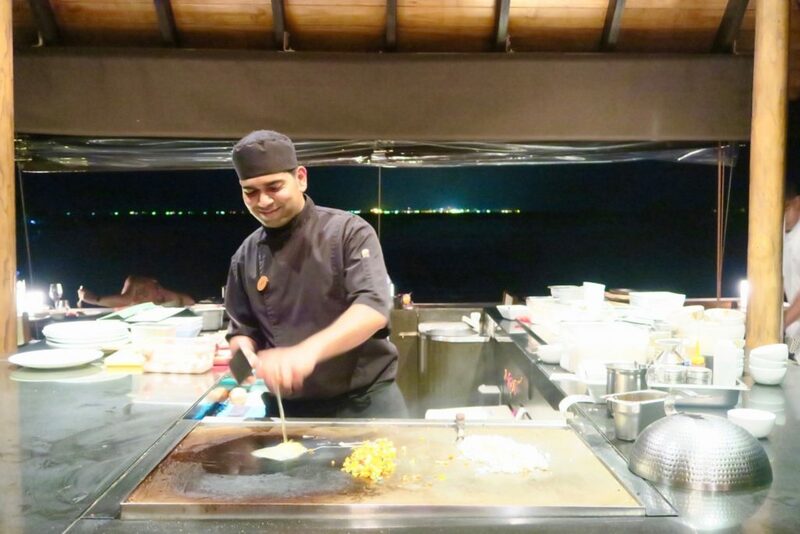 The Teppanyaki over the lagoon also offers a fun dining experience. The quick handed chefs certainly put on a great culinary show as eggs are spun and tossed in the air, cracked perfectly midway without any mishaps. We had seafood fried rice, lobsters and sushi overlooking the ocean (the restaurant itself is an overwater area) while sharks and fish literally swim around us. Buffet breakfasts are served at Vela Restaurant, where there’s a large selection of yogurts, muesli, smoothies, shakes and fresh fruit. 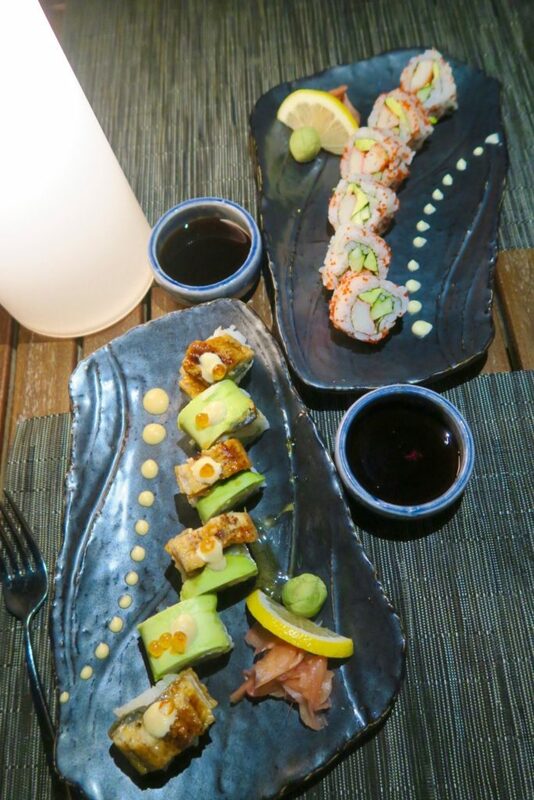 And also equal offerings of Maldivian, local and Asian dishes (Sushi for breakfast anyone?) and western breakfast selection too. Now before I ramble on further, do watch this resort tour video of my time at Velassaru Maldives! This video also includes underwater footage when we went scuba diving with the Velassaru Dive team. 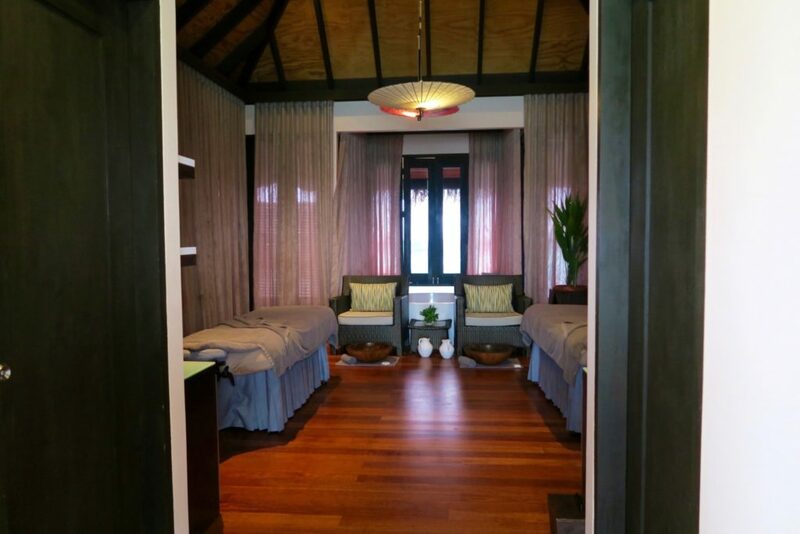 We had the wonderful opportunity to get a couples’ massage treatment at Velassaru’s overwater spa. I had a wonderful 60 minute Indian Head Massage (which also includes shoulders/ back). It was bliss! The massage also left my hair silky and smooth for days after. Zombie, in the meantime had a full-body swedish massage which also sent him snoring just minutes after the therapist started. Now I’ve coined a term for that state of bliss-drunken stupor after a heavenly massage: NoSpalgia. 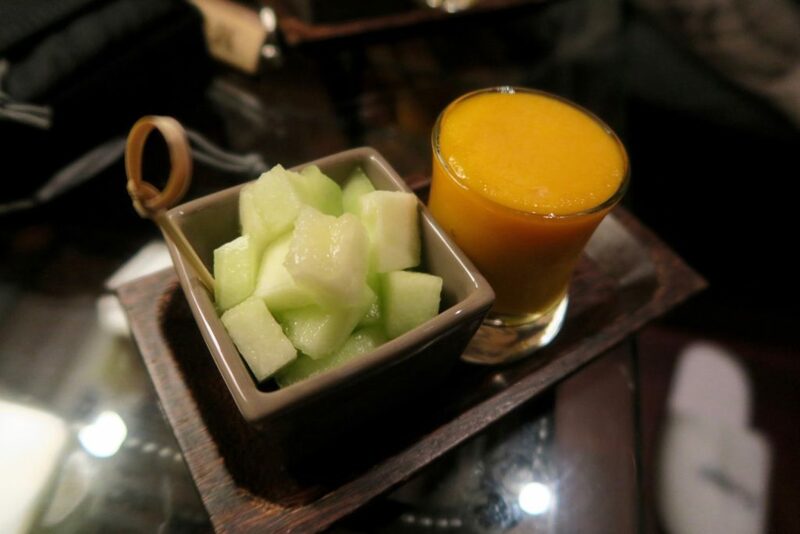 Recovery from Nospalgia is extra blissful because we were given a really energising smoothie shot and chilled honeydew cubes. So refreshing from the usual after-spa tea! 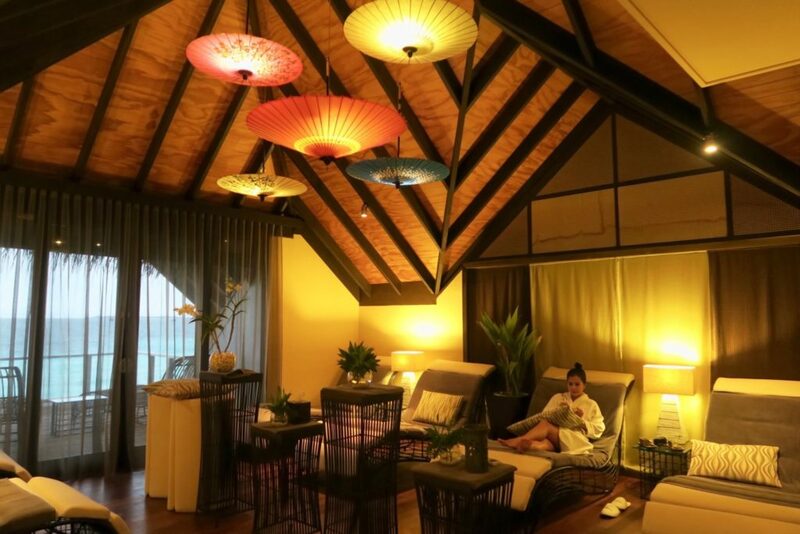 The Spa is also a 2-level overwater place with the “recovery” area on the 2nd level. The highlight feature of the spa would have to be the plunge pool / jacuzzi where you can have a dip as long as you wish after a treatment. I’m glad the weather decided to be kind for a few hours, just in time for us to be able to squeeze a dive in. Velassaru’s dive shop runs a very skilled and thorough team. Their divemasters are from various places all over the world (Germany, Hong Kong, Europe, etc) and all have worked as dive masters in different countries. I’m also glad that they were very thorough. Because my last dive was in March of 2014, they decided to do a ‘referesher’ dive for me in the shallow reef before we headed out to do our drift dive. I appreciated this because it made me feel much more comfortable when we were in the open water. 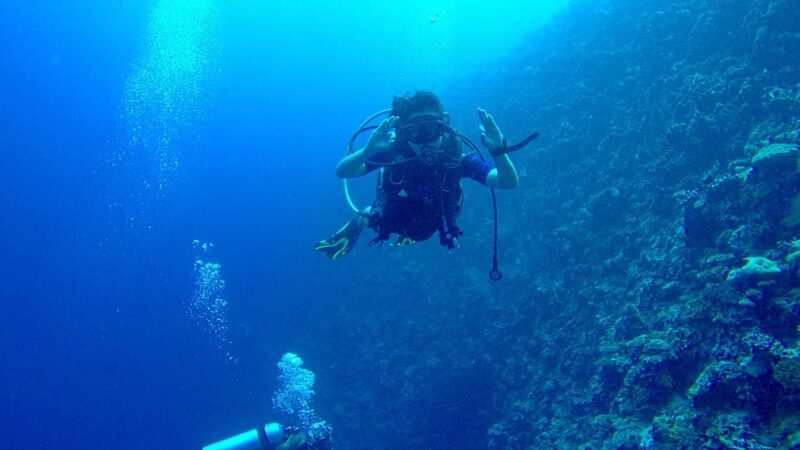 Due to weather conditions, we did a drift dive , where we go with the water current along a reef wall. We did see lots of fish too (as you can see in the video). 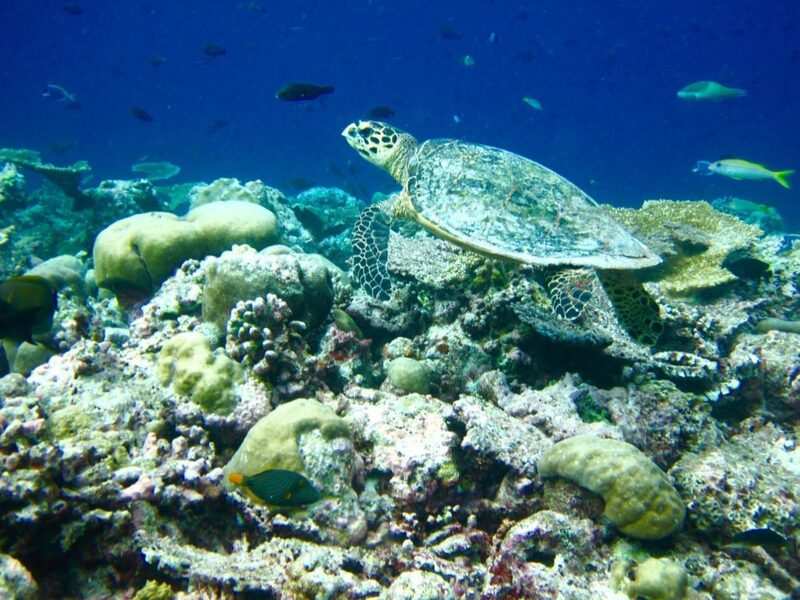 But it was while snorkelling in the house reef where we saw an eel and a turtle. (also included in the video). Our dive master Courby was very reassuring and knowledgeable and we also felt very secure having a private group dive with her (it was just her, me and Zombie). Despite being close to Male, the house coral reefs of Velassaru are very much alive and worth going underwater for. We also had the opportunity to go on a Dolphin Discovery cruise in the afternoon. Due to the season, we didn’t spot any dolphins so the afternoon became a lovely sunset cruise instead, which we didn’t mind at all. Customer service at Velassaru is warm and friendly. It’s perfect for those wanting all the luxuries of a resort without a private villa butler or excessive formalities. Don’t misinterpret this to be a ‘laid back’ kind of service though. It’s the kind of service where you feel that staff genuinely care for your well-being and not just doing it because its their role to do so. 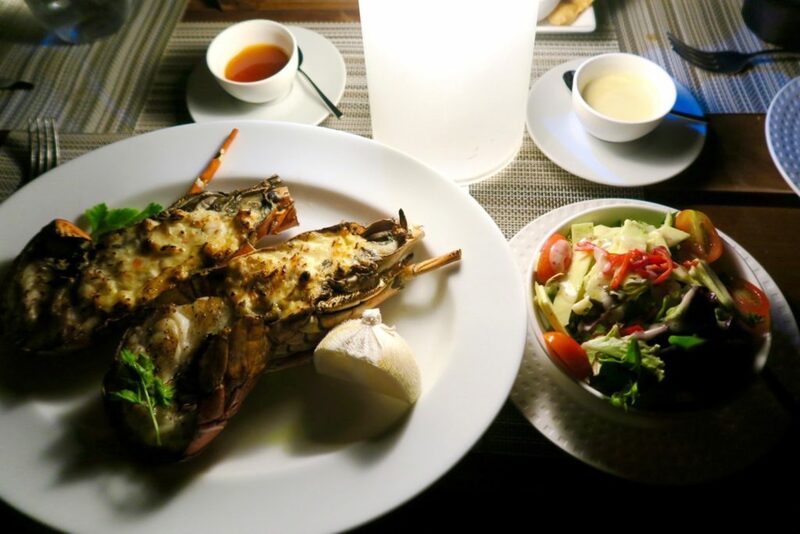 One instance that was really memorable for me, as we were walking back to our villa from the Teppanyaki dinner, we just happened to pass by one of the restaurants and the staff were saying good evening/ good night. After wishing them a good evening as well, we walked on. Then one of the staff caught up to us just to ask if we have an umbrella, because at that point it sounded like a thunderstorm was brewing. We told her that we’ll be fine, and we will just run to our villa. The staff, Kim, was adamant we bring an umbrella as she said we would probably not be able to make it. She ran back to the restaurant and returned to us with a huge umbrella in tow. True enough, less than a minute later, a huge downpour occured. Thank goodness for Kim who really cared for our welfare and knew better! Okay, so we did have a handful hours of sunshine. And it was magnificent. 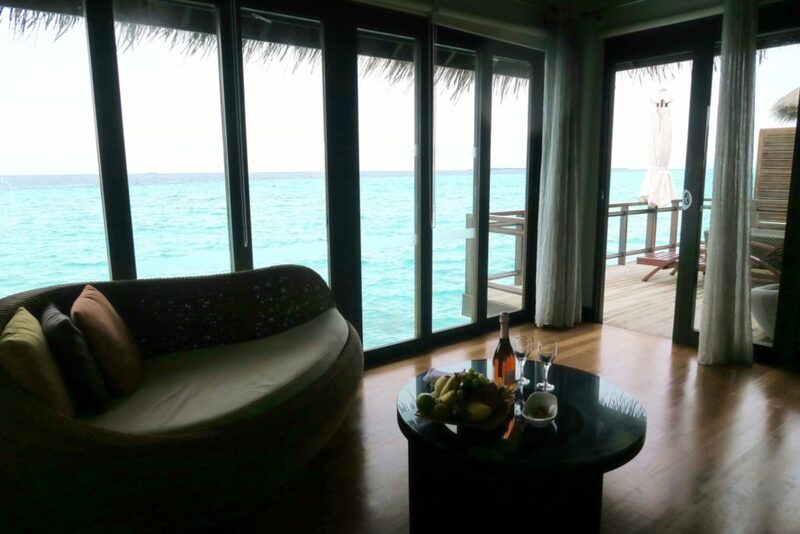 However, that’s not the factor that made our stay at Velassaru memorable. It’s the combined laid back and chill factor, with more than enough luxuries for you to feel pampered that stands out. Service that’s efficient and friendly without being too intrusive and in-your-face. There’s that feeling of freedom and spontaneity that sometimes can be missing especially on big chain resorts where activities are quite regimented. The food was also a big big plus as there is a big focus on incorporating a Maldivian touch with international dishes. And with the resort being a small island, it never feels crowded even on full occupancy. Are you into this kind of laid-back luxury? Do you let the weather affect your travels or do you take the weather with you? 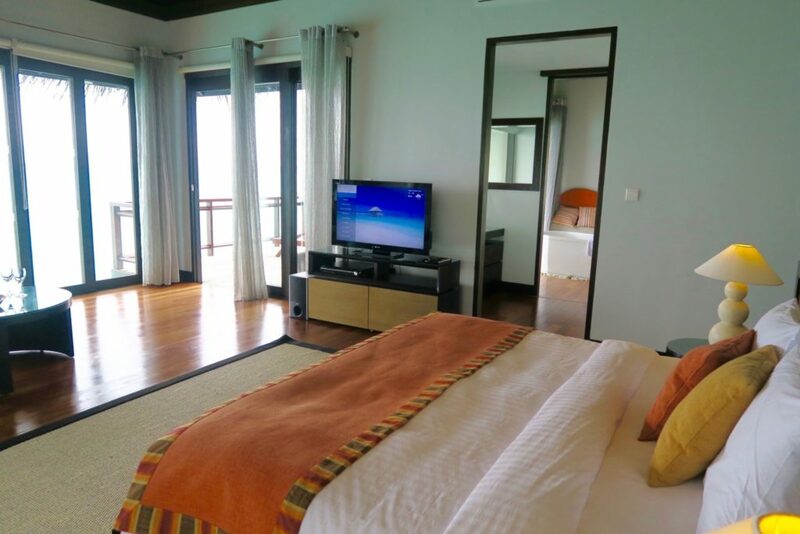 We were guests of Velassaru Maldives for the purpose of a review, however, there is no obligation to write a favourable article. Prices for April 2016 start at US$635 / night for a Deluxe Bungalow on Bed and Breakfast basis. Inclusive of return boat transfer. 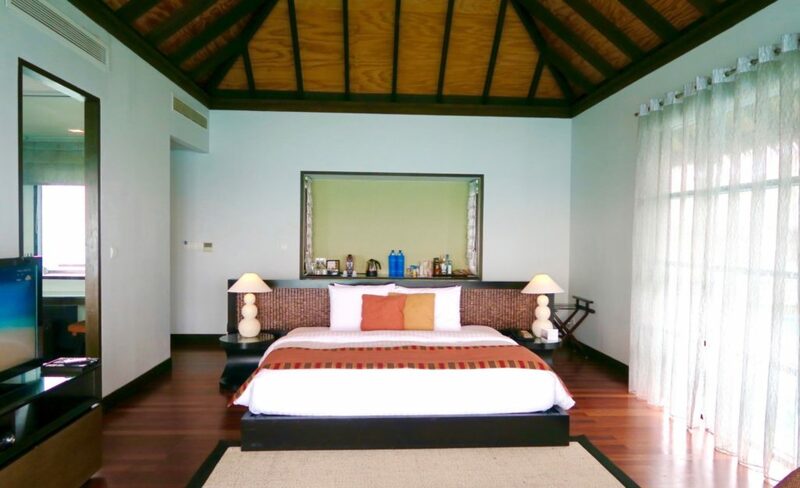 Rates for a Water Villa start at USD 1,349 / night on a B&B basis, inclusive of return boat transfer. Shame about the weather, I would have definitely gone for lots of nice food to make up for it! I agree that the weather isn’t the most crucial thing at all. 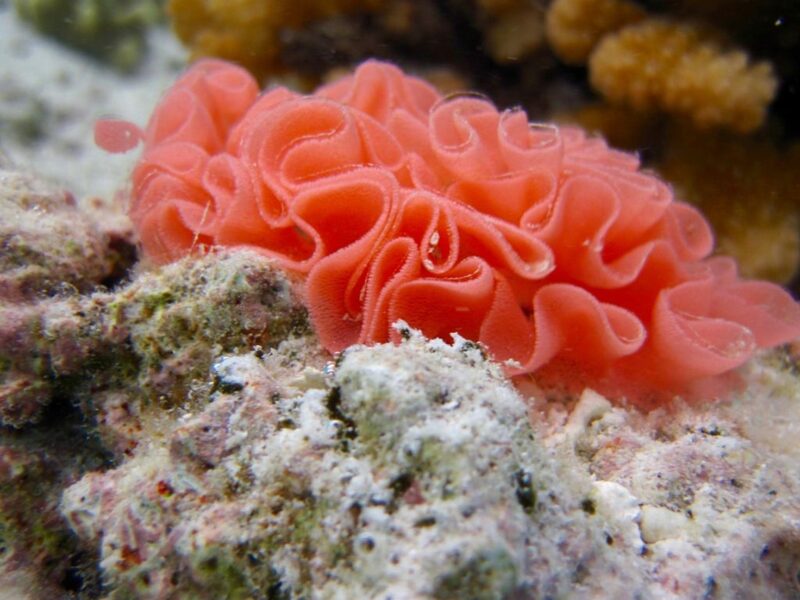 I love to spend time snorkelling so will be wet anyway and grey skies and a bit of rain won’t matter. We had one full day of light rain on our Fiji holiday in December and it didn’t matter at all. I so enjoyed reading this post. Have never been to the Maldives and I’d love to get there one day. I definitely wouldn’t take the kids, as I’d love to go to an adult-friendly resort with my beloved. Maybe we should do this for his 50th later this year?? Happy New Year, and I very much hope we might meet finally in person in 2016! Hi Seana, when it’s a city destination, I have to admit the weather sometimes gets to me. But I find that in a resort, it’s a great way to discover other amenities like the spa and restaurants, which I often overlook when the weather is perfect. I hope you’re enjoying 2016 so far and I also hope to get to meet you soon! Ummmm….. YES! I would be happy as a pig in mud, regardless of the weather, but realistically, not much affects my eating patterns. LOL! I love this kind of laid-back luxury, and you make me want to hop a plane there stat. 🙂 Hope you had an amazing New Years Jean, and that your 2016 is loaded with all the awesome! Glad to know you enjoy Indian head massages too! Sometimes I prefer that to a body one. It’s just soo relaxing! that looks amazing, planning a maldives trip this year and i wanted to know what the LOW seasons are! Hi. Nice blog. Love every bit of it. Just wanna ask, did you avail their transfers back and forth? how much is it per person? it it obligatory or we can just get a speedboat directly from the port? since its cheaper, I guess. What can you recommend? Thank you.